As far as you don’t know yet I am addicted to Thai food. I love to cook Thai curries all ways and noodles and everything about that. I adapt it to myself as far i don’t eat so hot dishes as they usually are. One day I decided to have Thai herbs garden. Well, it’s cold outside and I was thinking about starting indoors. I bought seeds of thai basils and the Kaffir lime at thaiseeds.com and started to propagate the Kaffir. The first experience was bad. They died under mildew. I gave it a try for a second time with extra re-hydrating them in wet cotton for 24 hours before I put them into Jiffy’s tablets. The tablets are made from substrate for propagating seeds and easy transplanting them in a pot or a garden. After almost 2 weeks I saw the seed raised a bit and the next day it was like on the picture one. After 4 more days it looked like at the picture two. It’s growing fast. i transplanted it in a pot and covered with a jar until it gets bigger. 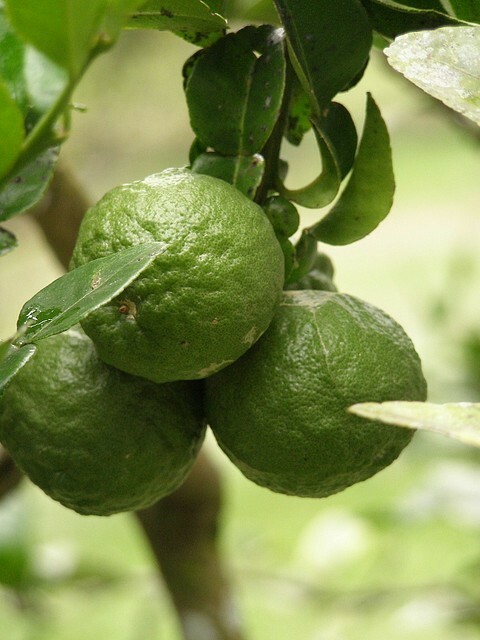 Kaffir lime leaves are most often used as an essential ingredient for flavoring many Asian dishes. I found fresh in local Mars and Spenser store for USD2.5 for just 4 leaves. The dark green leaves come in double form – a more pointed top leaf joined to a more rounded bottom leaf. They impart not only a sweet, lemony scent but a wondrous flavor of their own to soups, salads, curries and stir-fried dishes. For watery simmered dishes, the leaves are bruised and added whole; for dry dishes, they are cut into very fine hair-like slivers. To sliver, stack a few leaves at a time and cut at a slanted angle with a sharp knife; or use scissors. let’s return to our muttons, I meant mussels. We stuck to some Belgian restaurants for a couple of months and, of course, all that is about mussels. We tried different but the most favorite is Thai style in coconut milk. Remembering mussel’s evenings in France we decided to repeat it here. We bought 4 kg of fresh mussels (it should be for 5 persons). My husband always wash and clean them. I tried once and all my hands was scratched and in pain, mussels still were not good enough and since then I have never tried it again. This is the most unpleasant part about cooking mussels. 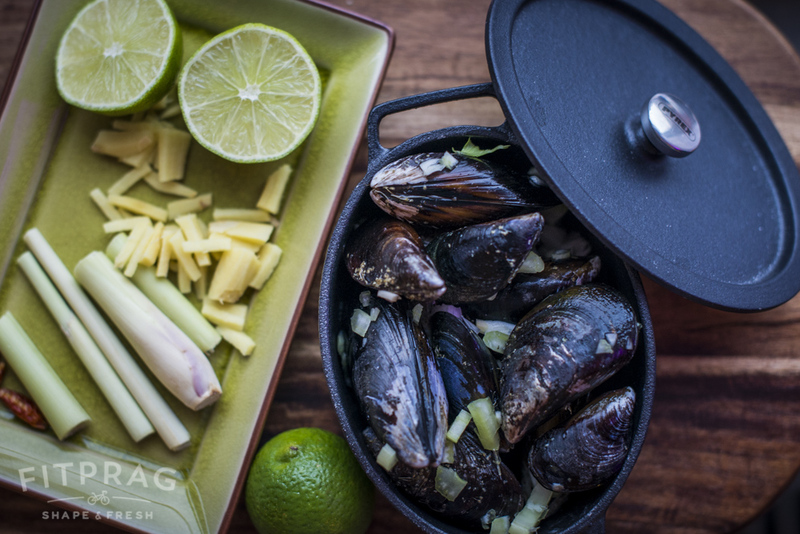 The recipe contains two parts: mussels boiled in white wine with celery and onion and Thai sauce. I prepared spices and herbs for the Thai sauce. galangal (optional but worth to find) It’s a type of ginger but it has more specific aroma. It’s not edible by the way. Too hard. Preheat oil and curry paste, add one tablespoon of coconut milk and stir the paste. Add all milk and all ingredients all together (except lime juice) and cook for 5-10 minutes after boiling. Add lime juice at the end and leave by side. Cut celery and onion into small pieces. Put mussels and vegetables in a pot and add wine. Cook them about 3-5 minutes after boiling. Than pour off the wine to another pot. You will probably want to mix it in Thai sauce later. Put mussels in a big pan by portions. Pour Thai sauce and wine sauce on top. 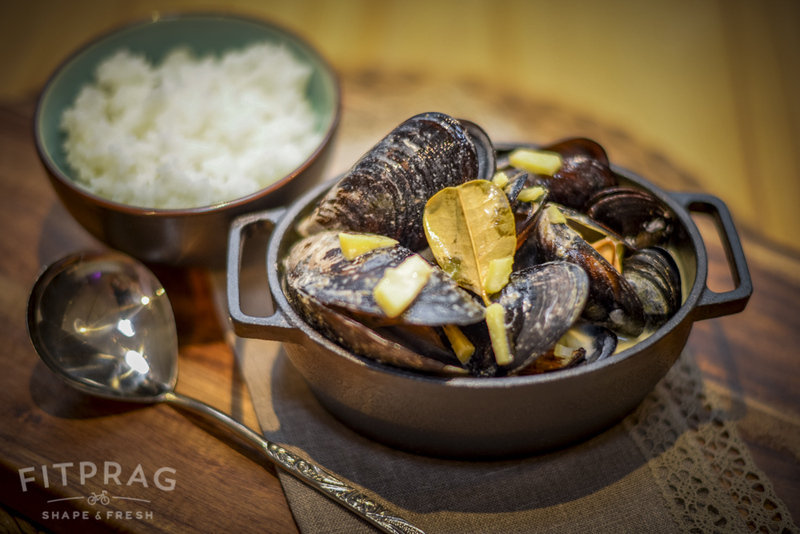 Precooked mussels and prepared herbs and spices. Can be eaten with jasmine or basmati rice.